JJ’s Place is a perfect blend of rustic funk and fine craftsmanship. This unique Tiny Home was built on a 24’ Gooseneck trailer with an additional 7’“upper deck” which provides a bedroom with 6’ of headroom. The bed platform was cantilevered out over the cozy living room seating area to provide room for a closet and shelving plus under bed storage. 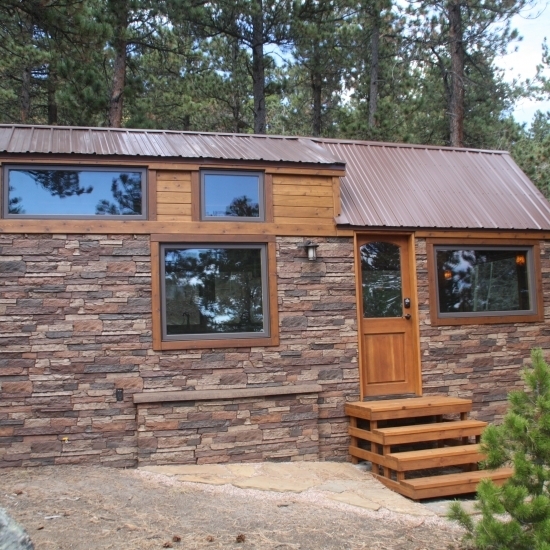 The owner was excited to use old rusty tin roofing which highlights the kitchen walls. The large galley-style kitchen provides ample space for the best of gourmet cooks and is equipped with an Energy Star rated refrigerator and three burner propane range. The bathroom has a large shower with metal surround, a Nature’s Head composting toilet, and an on-demand, Tankless Water heater for never-ending hot showers. 328 square feet of luxury Tiny Home living at its best.